Continuing with a review of the earliest printed books in the Yale Law Library, we move from Strassburg in 1471 to Naples, and a printer who learned his craft in Strassburg. The printer’s name was Sixtus Reissinger, the first printer in Naples. He was part of a wave of Germans who introduced printing in Italy, and who also pioneered the use of roman typefaces. 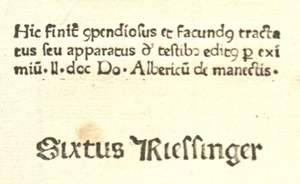 Reissinger partnered with Ulrich Han on the first book printed in Rome. By around 1470 Reissinger moved to Naples, where he was active until 1478. He returned to Germany for a time. From 1481 to 1484, the Incunabula Short Title Catalogue shows him printing again in Rome. Law books formed a significant part of Riessinger’s output, mostly commentaries and treatises by authors such as Baldus and Bartolus. He also published classics including Cicero and Ovid, as well as religious works. We own one of the rarer products of Riessinger’s press, the Tractatus seu apparatus de testibus by Albericus de Maletis (Naples: Sixtus Riessinger, ca. 1471), a brief treatise on witnesses in Roman law. It is the only copy of this edition in the United States; ISTC reports only two other copies in Germany and three in Italy. Lotte Hellinga, “The introduction of printing in Italy: Rome, Naples and Venice.” Part of the excellent “First Impressions” website of the John Rylands Library, University of Manchester. Clifford W. Maas, “German Printers and the German Community in Renaissance Rome.” The Library, series 5, 31:2 (1976), 118-126.